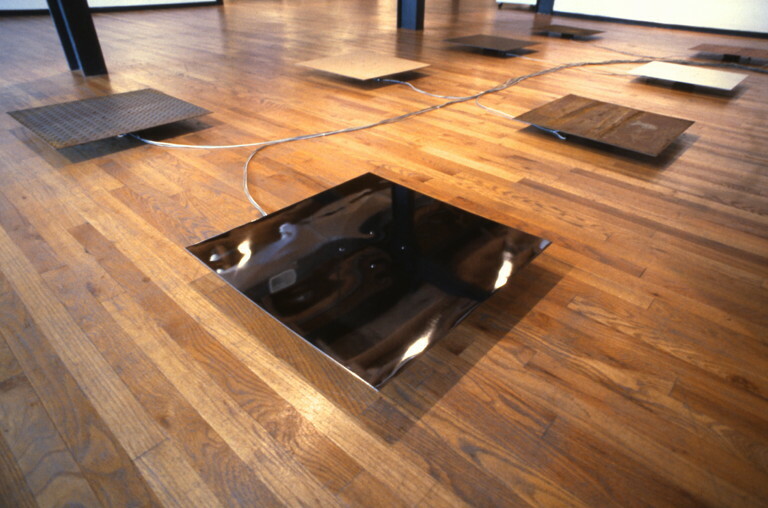 Nine metal and wooden plates are arranged on the floor. Viewers/listeners move freely around and between the plates to experience a constantly changing sonic environment. The sounds the one hears are the result of two simultaneous operations. Each plate is equipped to produce sound and pick-up sound with a microphone. A computer "listens" to one plate, and transmits the sound it "hears" to several different plates, thereby diffusing the original sound. The computer continually changes both the plates that are producing sounds and the plates that are listening. The resulting sounds are a shifting combination of the resonant characteristics of two or more of the plates. The plates in this installation can be thought of as loudspeakers, each with its own resonant personality. This installation refocuses attention onto the sounding object itself, and prompts us to consider the elements of time and change involved in their cyclical and continual processes.